The sheep trying to push her own insides out. Makes you glad to be alive. It's the second sheep to prolapse now so I'm a little worried. They don't seem too fat so I'm not sure what's causing it really. I managed to push it all back inside her, let her have a good wee (as they can't when it's all pushed out) and fix a harness on to her. 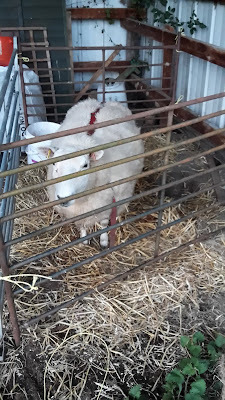 The harness or trusses give the ewe some extra support and help to keep things where they should be, although it can still pop out now and again. The one in the picture above had damaged her insides slightly (or reed as we call it) so I'll keep a close eye on her now and make sure she gets any medicine she needs. The lambs keep turning up though we've had another double and two more singles so far. Pretty poor average (two lambs a sheep would be perfect). But all healthy and happy and lambed themselves so that's all that matters. I once read that docking their tails too short increased the chance of prolapse, but if I'm seeing correctly, that wouldn't seem to be the problem with yours. She's not looking too good when I went down to see her tonight on my late night check. White mucus coming out of her rear. When I tried to insert my hand she wasn't dilated so not lambing so I'm guessing an infection. I gave her a shot of antibiotics so we'll have to see if that makes any difference and see if she makes it until morning. jeeze, that would freak me out. Well, dang. If it's not one thing, it's another. Sure hope she pulls through this. I know you're keeping a close eye on her. Wishing all the luck. Oh what bad luck. Hope the sheep survives, and hope that the rest of the flock remains healthy. We had twili cows with prolapse. Neither had calved recently. The vet said the cause isn't really known for sure. One cow was repaired and the other had to be put down. Sheep would be easier to work with! Hope your two recover. Good luck with the rest of your lambing Kev. It's rare to have a stress-free lambing season if you have a few ewes, but you have the experience to address the problems while knowing when to send for help. They prescribe ring pessaries for prolapse in humans, is there any such thing for sheep? Sorry to hear you have had 2 prolapses. I wrote a short post about it a few years ago. Myself I wouldnt keep them, as my family have never found that they are financially viable after. After you add up the antibiotics and putting them to tup and nothing for a year or 2, or happening again or even still births. My dad would say thats a pet now. 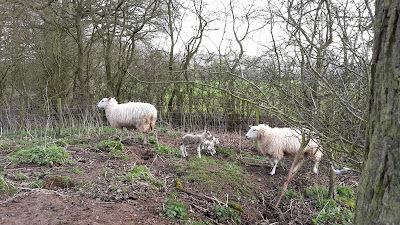 WE had a sheep prolapse (put her whether out) just after lambing when I was lying in bed just after giving birth to my second son nearly 31 years ago. The vet sprinkled the utuerus bed with sugar to drive the excess moisture from it and it slid back in all by itself. All our ewes were broken mouthed, bought for their last crop of lambs and then sold on as fat that summer.